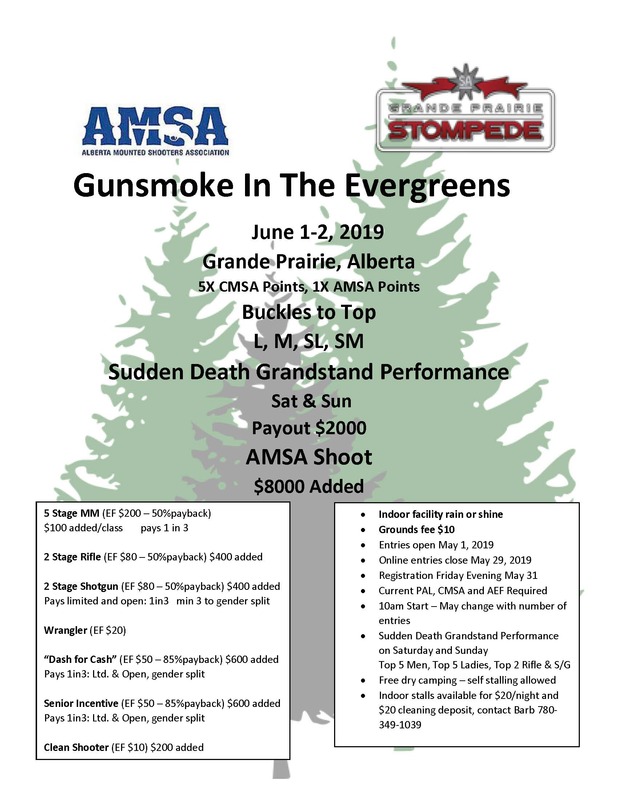 In conjunction with the Grande Prairie Stompede. 5X CMSA points and 1X AMSA points event. Buckles for top M, L, SM, SL. 5 stage pistol. $200 EF, pays 1 in 3, $1000 added to date. 2 stage rifle and shotgun. $80 EF, pays 1 in 3, limited and open, minimum 3 per class to gender split, $200 added. Dash for Cash - $50 EF, 85% payback plus $600 added. Pays 1 in 3 gender split, limited and open. Senior Incentive $50 EF, 85% payback plus $600 added. Pays 1 in 3 gender split, limited and open. Two-day Grandstand performance for top 5 men and top 5 ladies pistol, and top two rifle and shotgun. Pays $1000 each day. Indoor stalls available @ $20 per night plus $20 cleaning deposit. Contact Barb Morris @ 780-349-1039 to reserve. Free dry camping no hook-ups. Self-stalling allowed. Free dry camping. No hook-ups.